Amelia Earhart's fearless, adventuresome spirit leads to hair-raising rides down her homemade roller coaster, and she is enthralled with the wonders of the new "flying machines" during a family vacation to the Iowa State Fair. As she matures, she volunteers as a nurse's aide during WWI and seriously considers becoming a doctor. This idea "flies out the window" when she pays a pilot $1.00 to take her up for a short "hop" in his plane. From then on, the science of aviation becomes her passion as flying becomes her career. An early STEM pioneer, Amelia follows her dreams with an indomitable spirit, and she will inspire students to believe in themselves, have empathy for others, and pursue their own gifts and talents to the fullest. Amelia went to Hyde Park High School in Chicago and is a local heroine! "Absolutely terrific for our grades K-5! We highly recommend it to other schools!" "These programs never disappoint. Professional, well organized, interesting - just outstanding!" "Wow! 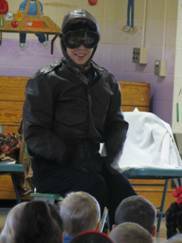 Students were completely enthralled!" "Great messages - set high standards, believe in yourself, and never give up!" "Students were spellbound! Thank you!" "What a fantastic performance! 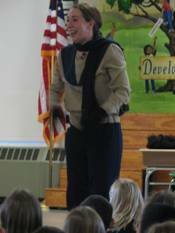 The actress really engaged the students and brought Amelia Earhart to life! Thank you!" "Riveting! Kept the attention of all students. Great history, compelling story. I have always enjoyed all the programs from this company." "Excellent! There was great energy in the room. Wonderful lesson - with hard work and perseverance, you can do anything you want!"